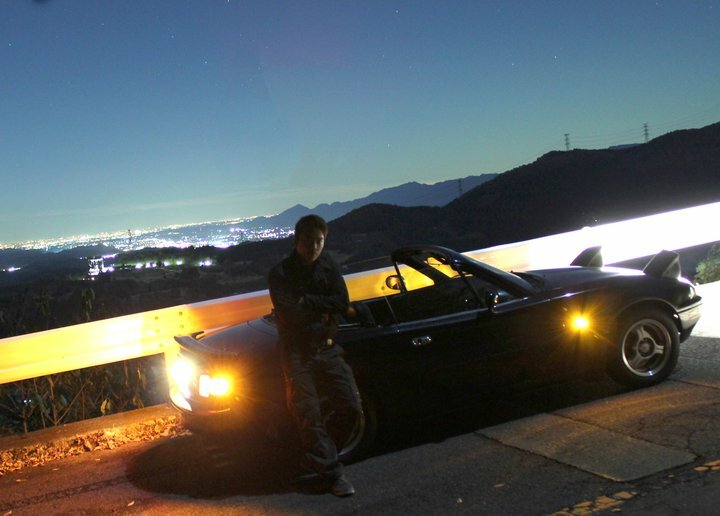 Ever since I found out about my placement last year, I had been dreaming of living out my Initial D fantasies since my prefecture, Gunma, is pretty much the mecca of a uniquely Japanese form of motorsport called Drifting – or more accurately, touge racing. A little bit of a history lesson will follow. 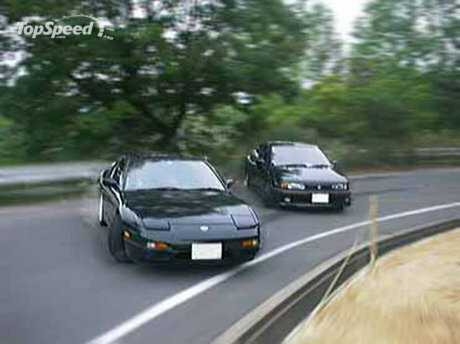 Popularized by the incredibly popular anime, Initial D, drifting in its current evolution is a highly competitive motorsport where competitors intentionally oversteer their cars, causing a loss of traction in the rear wheels and letting the rear slide out in a controlled fashion around a turn. To a skilled driver, the use of drift techniques can be extremely impressive during a race or skill competition in control. 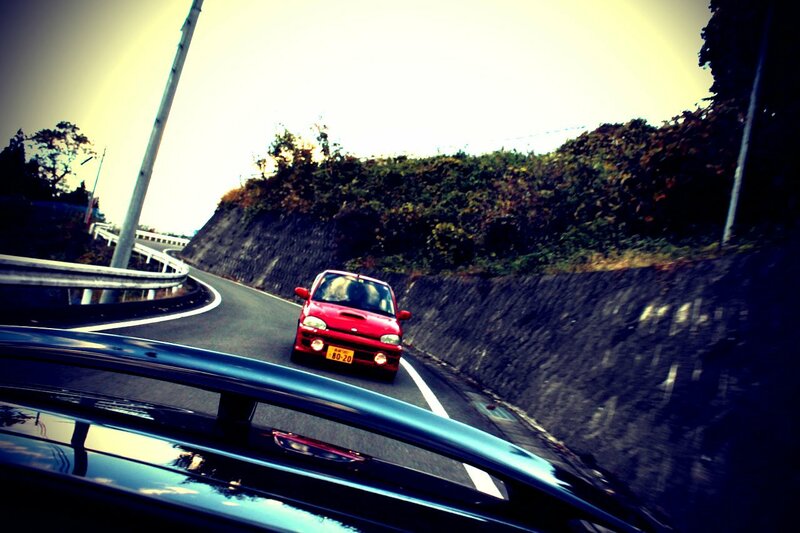 So since the 70’s and 80’s, touge has been a popular past time of thrill seeking Japanese people due to the abundance of long stretches of winding mountain roads. The underground sport exploded into the mainstream due to the popularity of movies like the Fast and the Furious and the aforementioned Initial D.
It seems so dated now haha..
Needless to say, I excitedly anticipated the prospect of getting my own car once I got to Japan and driving around those same mountain roads I had up to then, only seen in movies and films. Well..this post is a little late in coming, as I have had my car for a full 3 months now. 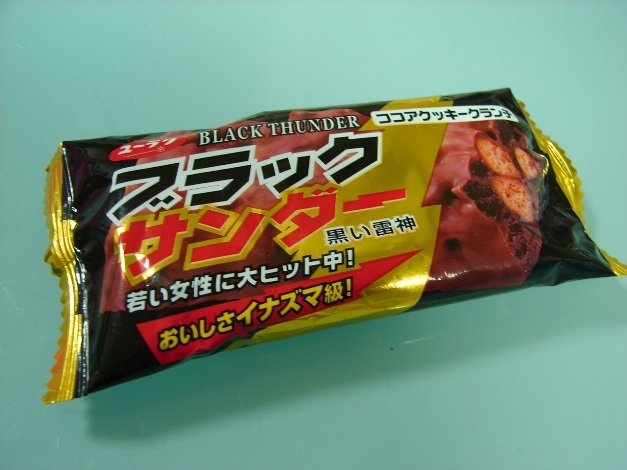 I suppose I should introduce you to my ride, which I have christened “Black Thunder” due to its rumbling exhaust note and the fact that I was eating an icecream bar called “Black Thunder” when I decided this. mmm..dericious. Wait, this is the icecream, not my car! 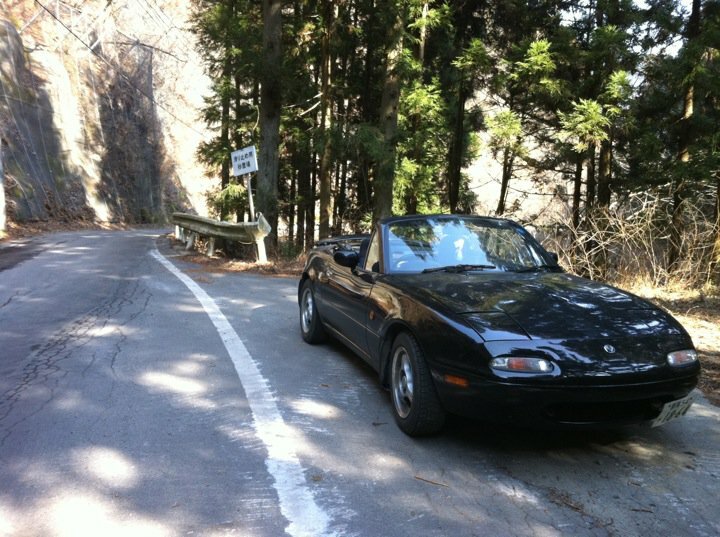 It’s a first generation Mazda Roadster, otherwise known as the MX-5 or Miata back in North America. 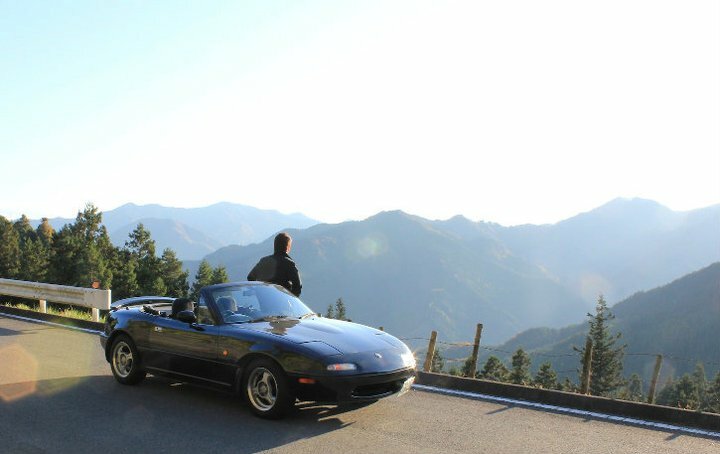 I don’t know what I did in my previous life to deserve this, but I was not only placed in the land of the touge, but MY NEXT DOOR NEIGHBOUR/FRIEND happened to be selling the roadster for the exact amount I had saved up to buy a car. Talk about sublime serendipity. The car has been a joy to drive and own. It’s got quite a bit of aftermarket modifications so I don’t really feel any need to drop any big upgrades on it. However the best part about good ol Black Thunder is that it’s a convertible! There is no feeling better than cruising the winding mountain back roads 15 minutes away from my apartment on a lazy Sunday afternoon with the top down and the sun beaming down on me. This is a 15 minute drive from my apartment!!! However when the mood strikes me, I sometimes go for late night drives through the mountains to clear my thoughts and enjoy the spectacular night views. Sometimes, I encounter other like minded auto enthusiasts driving decidedly higher powered RWD and AWD chariots, screaming with the fury of two hundred or more horses. It’s at this point that my Initial D day dreams come full circle as I find myself playing a light hearted game of keep up with much more talented drivers than I. 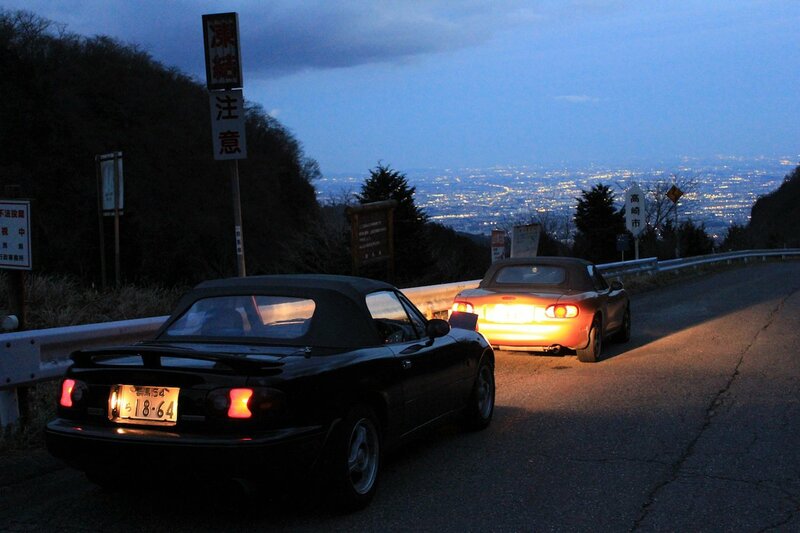 Meeting a fellow Roadster driver along the mountain roads. 2:00AM, Mount Myogi. That’s the actual incline of the road. 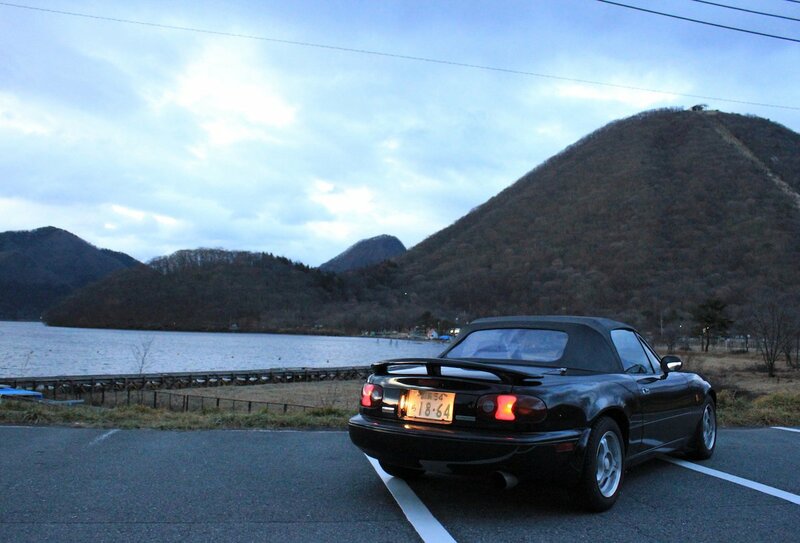 Here in Gunma, there are a bunch of other JET’s/foreigners who drive sportscars. One of them drives a GTR! Jeez. 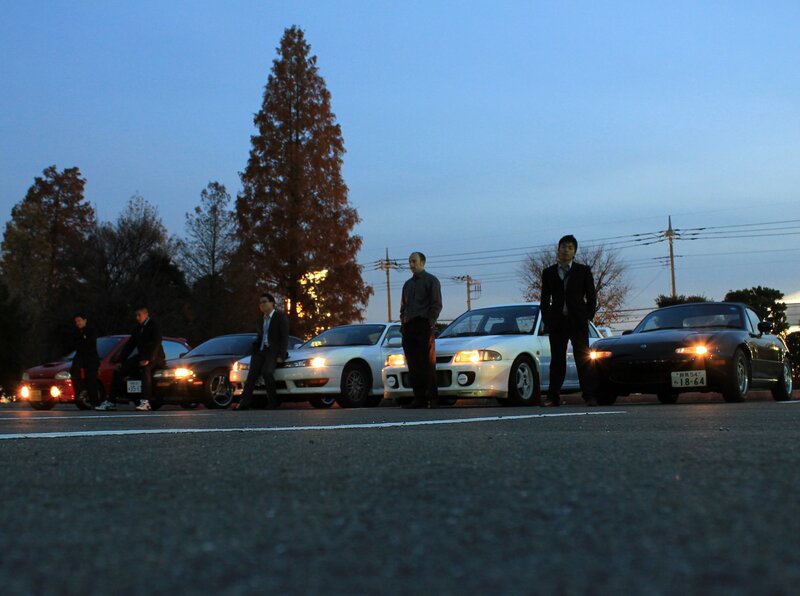 Anyway, here is the group of us; The Gunma High Octane Club (kind of funny to be part of this club since my car takes regular gasoline). My good buddy’s turbocharged kei-car. I think buying a car has been one of the best decisions I’ve made since moving to Japan. Having a car opens up your world so much. Suddenly, you are no longer limited by the reasonable distances you can reach on your bike, or the two directions your nearest train line runs in. You can go anywhere! I plan on driving to the coast of Japan soon, just because I can. If you ever plan on moving to Japan, get a car. You’ll thank yourself for it. On that note, if you’ve never owned a sports car, buy one. You might just thank me for it. All current and former JETs know about the terrible anxiety and stress that comes with the official JET Programme Waiting Game (TM). As a recap and for those unaware, the application process opens sometime in late September or early October and begins with a paper application that must be completed by the end of November. After filling out a massive 40 page application, writing a stunning essay and collecting two of the most saccharine references of one`s life, so begins the massive wait until interview notifications are sent out in January. The interview takes place in mid to late February. You dont find out if you made it until mid April. At this time, prospective JETs have either just had their interviews or will be having them very shortly. I vividly remember the many nights I spent preparing for the interview like a madman and my heart goes out to all of you who are going through this. Right now though, I`m actually going through the stress of the interview again as well! Three of my friends (two of whom I am extremely close with) have their JET interviews next week. So for the past couple months, their stress has been my stress. It`s like deja vu stress! And here I was thinking I was past all that. This past week, I have been helping them practice by doing mock interviews, and today we spent 4 hours over Skype practicing. 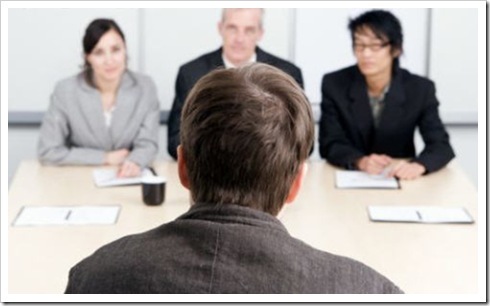 I truly believe if you haven`t had your interview yet, you mock interviews are the most practical way to use your remaining time to prepare. I wish all you guys who are applying for this year tons of luck. By this point, you`ve either done all you can or are brushing up last minute for the big day next week. Either way, I`m sure if you`re reading this, you`ve gone through every forum post, every JET video on youtube, and read every possible morsel of advice you can find. I don`t know if theres much more I can offer (I already wrote a massive post on the interview here) but let me just give you something to think about. This is what you will feel in the waiting room right before you are called in and how you can prepare for it in those final seconds. As you sit in that stuffy waiting room, watching the incredibly cheerful JET Life video playing on the TV (which will seem to be far too cheerful for the occasion) you will most likely feel the symptoms of (at best) nervousness or (more normal) absolute dread. As the adrenaline kicks in, your palms will start to sweat, your heart rate will increase, and your mind will jump back and forth between flashes of certain doom and total victory as you try to remember your notes and hours of mock interviews. Breathe. In. Out. Deep breaths. Feel the air filling your chest and flowing out you. Notice how curiously, you aren`t nervous – your BODY is just displaying the symptoms of nervousness. There is no need to identify with it. You can just observe it from inside your own head and acknowledge the process that is passing through your body. Smile to yourself and remember its only a big deal if you make it a big deal. It won`t be that bad. If you are reading this, you will probably have prepared for the worse case scenario. Even if you get the dreaded war tribunal panel, you know this is just their way of trying to smoke you out. Just keep smiling, laugh at yourself if you mess up somewhere, and thank the interviewers for their time. This is your moment. Seize it. So I pretty much gave away the content of the post in the title. This past week, I had to finalize my decision as to whether or not to stay another year on the JET Programme. I actually received the papers around January 16 or 17 last month and spent an entire 5 minutes deliberating my decision before signing it and handing it in for approval. I don`t know if that`s some kind of record or something. I was kind of alarmed how quickly I made the decision although I had been thinking about it already since I first arrived. After being here for 6 months, it amazes me both how far I feel like I`ve come and at the same time how little I`ve scratched the surface of what it means to live in Japan. 6 months flies by like nothing at all and I can still vividly recall the sense of wonder I had as I first walked through the neon streets of Shinjuku in Tokyo. There is still so much to do. There is still so much to see. There are still so many lives to touch. Viva la vida. For the past little while, I`ve been blogging really infrequently, dropping by only to add a new mega post every once in awhile. I think it`s because I`ve gotten used to updating my friends and family on facebook instead of blogging. I realized though that a lot of you guys reading this are people who have come across my blog from other sites such as the various JET forums and through googling around. So I`ve decided I`m going to start trying to post more often about daily things that happen so as to make my blog more of a resource for prospective JETs who want to learn more about the JET Programme. After the sumo tournament, some of the JETs and I decided to spend the rest of the evening in Tokyo, enjoying the night life. Our first stop of the night was dinner at some hole in the wall Jamaican restaurant. Surprisingly, the food was delicious, and even more surprisingly it was rather famous – as evidenced by the wall of pictures with celebrities. Snoop Dogg had frequented this particular establishment at one point. Who would have thought! A plate of jerk-chicken and carribean rice later, we were back on the streets on a mission for a good time. One of the great things about a night out in Tokyo is that you never know where the night will take you. You just NEVER know. The characters you meet, the places you end up in, the things you witness – the mind reels at the prospect of adventure. On this particular night, we soon found ourselves in a Karaoke bar with some new Japanese friends. Being a foreigner in Japan is akin to having a special social pass. YOU are the ultimate ice breaker. You can walk up to anyone and start a conversation and 9 out of 10 times, it will go great because you are, by principle, different and exotic and cool. By 11:30pm once the group was sufficiently inebriated, someone came up with the bright idea to take to the streets again and go clubbing. I made known the fact that I had yet to go clubbing in Roppongi, to a chorus of “EHHH??? YOU HAVENT BEEN TO ROPPONGI??”. The matter was settled. We were going to Roppongi. Roppongi is one of the party districts of Tokyo. People dress to impress, and some of the most beautiful people in the world come out to play in one of the prime party hotspots in the world. Somehow we managed to find ourselves at a swanky club called Vanity on the 30-something floor of a huge skyscraper. This place was just oozing with class, money and pure unadulterated hedonism. 4 hours later, we stumbled back outside into the cool, arid Tokyo air, filled with the smell of expensive perfume, cigarette smoke and gasoline. After a brief meal/breakfast at Mcdonalds, we split up at different stations and began the long journey back home. I arrived back at my apartment at around 10:30 am and promptly passed out until 8:30 the following evening. Partying in Tokyo really takes it out of you. Yet I wouldn`t have it any other way. 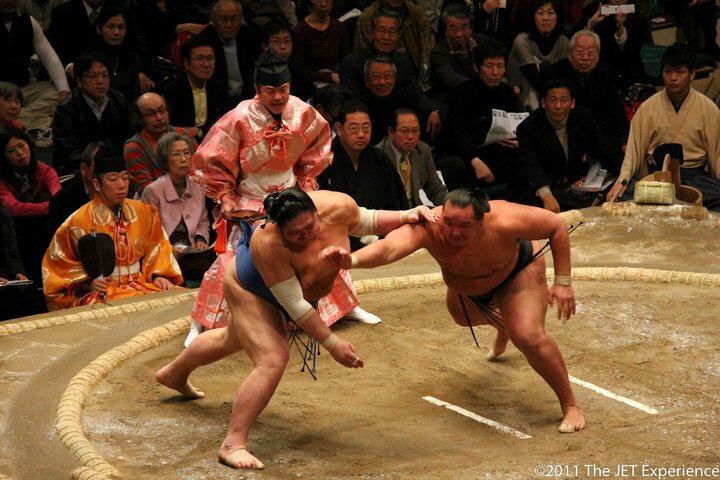 A few weeks ago, I had the opportunity to head to Tokyo to witness one of the days of the 2011 Grand Sumo Tournament. This famous event occurs three times a year in Japan, two of which take place in an area called Ryogoku in Tokyo. 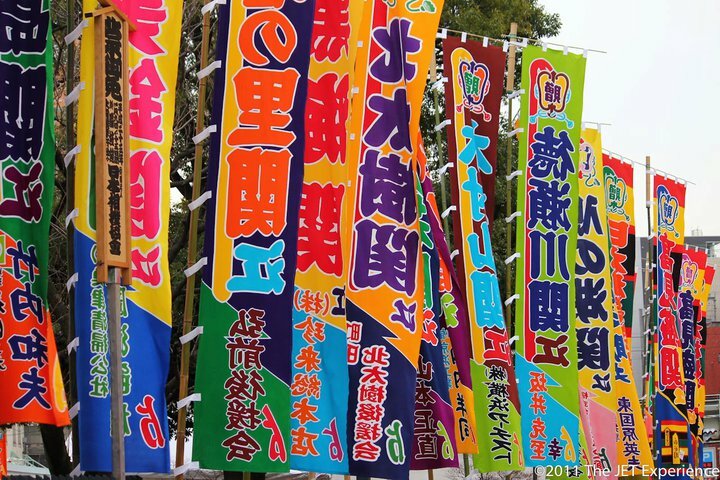 Colourful banners advertised the Sumo tournament outside of the venue. I, along with the other Gunma JETs, found myself at Kokugikan, the wrestling stadium at Ryogoku. It was absolutely packed and so we squeezed our way into the main hall and located our seats which all the way at the very very back. Although the view was not terrible from way up there, after 5 minutes of restlessness, I decided that it was still unacceptably far from the action and so began to concoct a plan to make myself seem like an “official photographer” as to gain entrance to the “official photographer area”. Frankly, this endeavor turned out to be easier than I expected. I casually walked down the aisles, waltzed right in, and took a seat beside the other photographers. A couple of them turned to me with quizzical looks and so I furrowed my brow and nodded intently. As long as you do things with an air of purpose and confidence, you can get away with anything. All the real photographers had much fancier cameras than I did. To be honest, I don`t know too much about sumo. 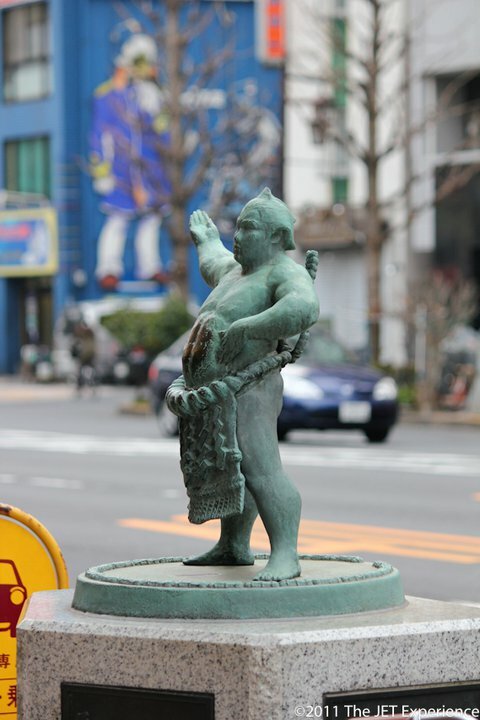 What little I have gathered, I picked up on the wikipedia article on sumo. However I was very excited to be at this event so I could film and document it. Sumo tournaments only take place in Japan so it was a thrill to be able to view a match in real life. 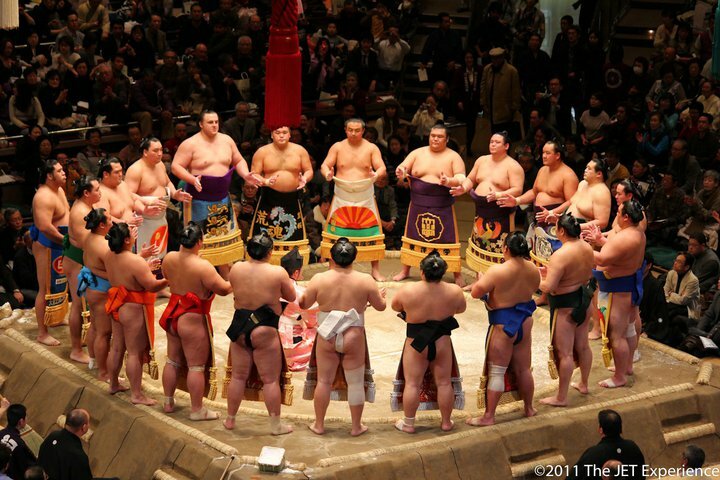 All the sumo wrestlers gather before the main matches. 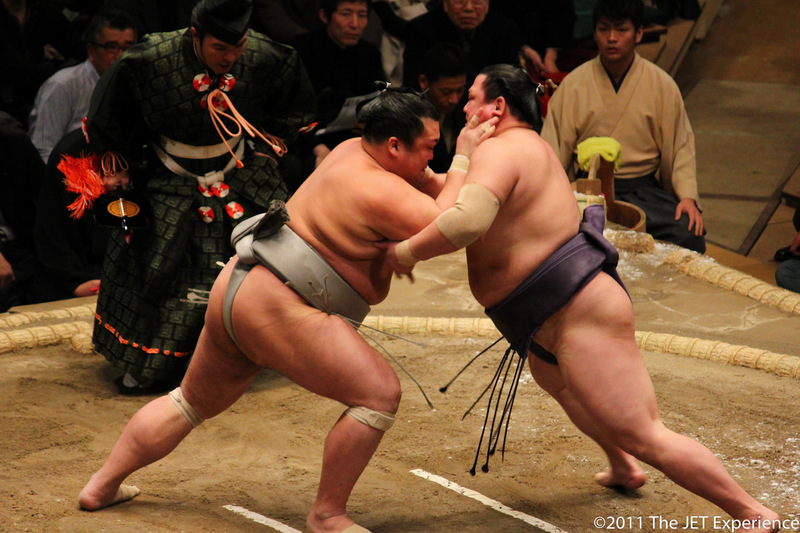 Far from being big ol lumbering piles of fat, sumo wrestlers are actually worldclass atheletes with astonishing strength, flexibility and speed.